The Reverse Power Relay T2000 will, during parallel operation, prevent the generator from running as a motor, thus protecting the prime mover e.g. a diesel engine and unloading the remaining generators by tripping the generator breaker. 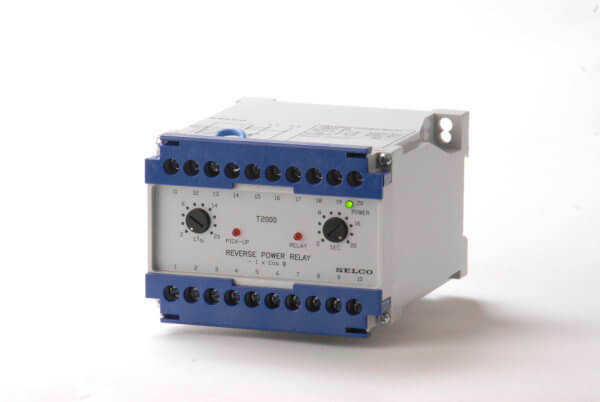 The Reverse Power Relay T2000 will protect the generator from being run as an electric motor. The T2000 will protect the prime mover of the generator against physical damage, but will also protect the parallel running generators from overload caused by the inversed load shift in a reverse power situation. The T2000 measures the current through an external 5A CT attached on phase L1. The phase angle (phi) is determined from the voltage measurement across L1 and L2. The T2000 calculates the active current as I x cos phi. If the active current becomes negative and exceeds the preset level (2 – 20 %), the pick-up LED will activate and the trip delay timer (2 – 20 seconds) will also activate. The built-in trip relay will energize after the delay has passed, provided that the preset trip level was continuously exceeded during the time of the delay. Protection of generator prime movers against reverse power. High precision digital countdown timer for delayed output. Direct Line-Line supply where neutral is not available. Accepts high supply voltage variations: 50 – 110%. Cost effective and highly reliable compact design. 50 hours burn-in before final test. Certified by major marine classification societies.